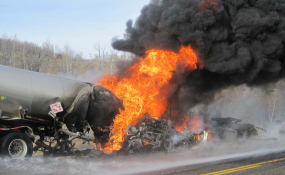 No fewer than 10 persons have reportedly died and several cars burnt when a petroleum tanker exploded Saturday afternoon in Gombe metropolis. Eyewitness said the tanker, carrying petrol, collided with another truck, carrying bottle water along Gombe southern bypass. Our Correspondent reports that over 10 bodies burnt beyond recognition were evacuated from the scene by personnel of the Nigerian Red Cross Society. Officials of the Gombe State Fire Service are still working to extinguish the fire.